We had a very special Christmas this year hosting our very special guests, Jim & Monita Bayles. Jim wished his Mom to have an “at home” Christmas this year and asked us if we would host this for him. We were pleased to do so. George and I had fun experimenting with various recipes that went above and beyond our normal Christmas dinner. As well this event necessitated a little more of the holiday decorating with outside lights, the tree and inside decor. 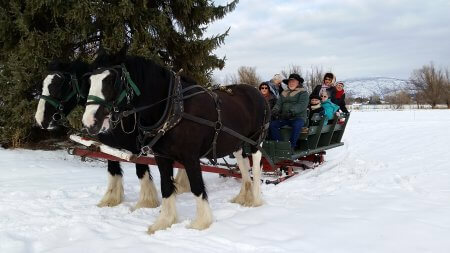 On Christmas day we arranged to share a horse-drawn sleigh ride with Harvey and Eleanor Brown from Harvelle House B&B, and some of local neighbours joined in. The day was crisp and sunny! Eleanor prepared rice krispie squares and hot chocolate and the horses were decorated with sleigh bells. Harvey has had these Clydesdales for some years now and they are very responsive to his voice commands. He whispered to me “Don’t say gallop!” What a treat! Afterwards we came back to the Blue Iris for wine and appies by the fire before a delicious turkey dinner with all the trimmings. We were sufficiently stuffed, just like the turkey, and all enjoyed this special Christmas Day at the Blue Iris B&B. Thanks Jim and Monita for asking us to do this. We really enjoyed it and it made Christmas extra special for us too!